Global demand for flavors and fragrances is forecast to grow 3.9 percent annually, reaching $26.3 billion in 2020. Flavor blends will remain the largest segment, while essential oils and natural extracts will grow the fastest. The Asia/Pacific and Africa/Mideast regions will be the fastest growing markets. 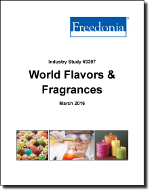 This study analyzes the $21.7 billion market for world flavors and fragrances, with forecasts for 2020 and 2025 by product (flavor blends, fragrance blends, essential oils and natural extracts, aroma chemicals) and market (e.g., food and beverages, toiletries and cleaners) for six world regions and 20 major countries. The study also considers market environment factors, details industry structure, evaluates company market share, and profiles 33 industry participants, including Givaudan, Firmenich, and International Flavors and Fragrances.